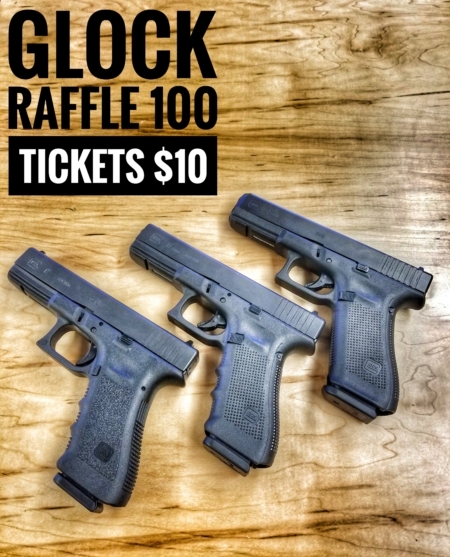 The raffle is for 1 Glock 17 of the winners choice. The winner can choose between a Generation 3, 4 or 5 depending on what state you live in. Each raffle ticket purchased will qualify as 1 entry into the raffle drawing. The raffle will close when all tickets have been purchased. The winner will be notified within 48 hours of the close of the raffle. The winner will be chosen at random by taking all the order numbers from the raffle ticket orders and inputting them into a random number generator app. The app will randomly choose an order number with the corresponding name of the raffle winner. All raffle ticket sales are final and are non-refundable. Raffle tickets can only be purchased from DOA Shooting Benches website. Any taxes, shipping, or fee’s related to raffled items won are the sole responsibility of the winner. Three (3) attempts will be made to notify the raffle winner based on the information provided by the participant: cell phone, email, and social media. If no response is received DOA Shooting Benches reserves the right to re-raffle the item as necessary. If the item raffled does not comply with state laws of the winner DOA Shooting Benches reserves the right to exchange the item for equal of lesser value item that will comply with the winners state laws. All raffled firearms will be shipped to a FFL (Federal Firearms Dealer). All raffle winners must: fill out ATF 4473 forms, be 18 years of age or older for long guns, 21 years of age or older for handguns, and must be capable of passing all federal, state, or local background checks. By obtaining a raffle ticket, participant attest that they are a law abiding citizen of good moral character, may legally possess any firearm won, have intention of using the firearm only in a safe and legal manner, and will or have already obtained instruction on the safe use and operation of any firearm won. DOA Shooting Benches gives no warranties regarding any firearms and no representations regarding suitability of purpose for any firearm. Winners are to deal directly with the manufacturer or FFL dealer in the event of problems.